K3U | What Does K3U Mean? K3U means "I love you". 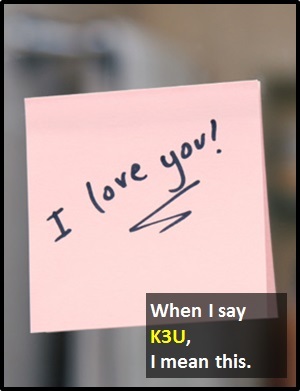 The term K3U looks like I<3U (I heart you or I love you). I<3U is an example of how text speak is more efficient than normal language (and also fun). K3U is a further efficiency. Learn more ways of saying I love you. Person A: Did you know K3U? Person B: That's so sweet. K3U is defined as a cyber term because some of its characters are used as substitutes for letters. Most cyber terms were introduced to reduce the number of key strokes required to write the word, but since the arrival of predictive texting and keyboards on mobile devices, this efficiency is no longer required. Nevertheless, cyber terms are still regularly used to make messages more entertaining or to express individuality. Cyber terms differ from icons because they are not pictorial representations.